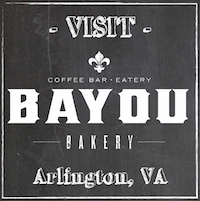 Begin your Mardi Gras marathon on Lundi Gras - Monday, February 8 here at Bayou Bakery, Courthouse in Arlington, VA! Mason Jar Mondays kick off with $5 cocktails. Plus, you can make this your Mardi Gras headquarters for FAT TUESDAY, February 9. Happy Hour begins at 4pm with Louisiana's own Abita Beer in souvenir Mardi Gras Cups before you head over to the parade!